On my AT thru-hike, I notice that I really liked taking pictures. Of course the mountains and various landscapes were beautiful, but I especially enjoyed capturing the smaller critters–bugs, newts, algae, etc. IPhone cameras actually do fairly well with macro shots, but it was hard to capture images as close as I wanted. A fuzzy caterpillar smiling for a picture on the Appalachian Trail in Maine (taken with my iPhone 6). Before heading out for the PCT, I decided to look into lens attachments for my iPhone since I don’t have a fancy camera. Through some research, the Moment lenses came to light and I’ve really enjoyed using the macro lens on my PCT hike so far! It opens your eyes to a whole new world. I enjoy taking time to appreciate the little things and taking pictures along the way helps me to appreciate what’s going on around me. Moment lenses attach to your phone camera by screwing into an adhesive plate you press onto the phone. It’s really that simple. I will be posting a weekly gear-related item. It will always be something I have used or seen used enough that I would recommend. Hopefully, this helps initiate conversation about gear and assist beginning backpackers with gear selection. Hi Dixie, I think you are a great photographer! Excellent composition too. And I enjoy seeing your photographs. Your still life’s are good too. I hope you are feeling happy and healthy. Get those knees in cold water when you can. Take your electrolytes every evening for recovery. Be well. I have noticed that your still shots and videos are really artistic – great job, you have a wonderful eye. I assume you are using an iPhone 7? I love following your blog and seeing your photos. You do a great job on both. How much time does stopping to take photos and videos take away from your actual hiking? Just curious. Keep it up! Be safe. LOVE your photos! I’m hiking the JMT this summer and looking into iPhone lenses. Do you know if any work with iPhone cases? What do you do about protecting your phone AND getting great shots? I tend to drop my phone all.the.time. Katie! Thank you 🙂 I take my phone out of the case before attaching the lens and I’m just very careful with the lens and the phone. I’m rough on phones, too! I hear that you can use the lens with the life proof but I don’t have that case so I can’t vouch for that. Hope that helps–have fun on your trip!! Dixie the video you just posted of the cactus flowers and bugs with the Moment macro lens are fantastic. Are you having any issues with the lens falling out of the mount or having dust between the lens and the IPhone lens? Thank you! Good questions 😉 I haven’t had any issues with it falling out, but if you overtighten it will come off. You just have to learn where that perfect twist is. No issues with dust really. I keep the lens in the little cloth bag it came in and I just try to wipe off my phone lens before attaching the macro. Hope that helps! Thank you for taking the time to respond. It’s nice to have feedback from someone who has used the lens system for a bit before plunking down your own hard won cash. 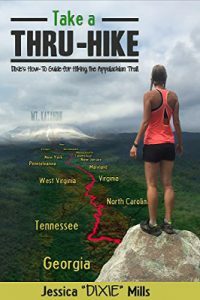 Hike your own hike and best wishes from a fellow Southerner. Thanks, Dixie for posting this. I love your macro shots. Hey Dixie, you might want to see about getting a external bluetooth microphone (no wires to mess with!) and use a “furry cover” so you don’t have to speak right into the phone AND you won’t get all the wind noise…. Just sayin’! Echoing everyone else, your pictures are awesome! And I love your macros….. they bring the trail to life with all the little stuff included! Rock on Dixie!!!! Wow! That might be something I need to look into. Thank you so much! Love watching your videos and seeing your photos. Thanks for what you do. Dixie, you have a real eye for video editing. Question for you, which app do you use while on the trail? Also, I haven’t found any video editing apps that can slow-mo a clip as much as I want. They all seem to be limited to .5x, or something like that, which isn’t nearly slow enough. Any recommendations? Thanks! Dixie, I’m really loving your photos on this trip. The Macro lens makes such a difference. Have you had any experiences you can share with other Smartphone lenses? Good luck on your hike! Hey Jen! Thank you 😀 I have only used the Moment lenses so far. If I try any others and like them, though, I’ll be sure to share! I just found your blog and You Tube channel. I love following your journey! I know another guy who is currently on the trail up on Nor Cal. I am curious as to which tripod you are using for the iPhone. Thanks! I’m loving following you. I really hope this company is giving you a kickback. I purchased the macro based on one of your recent Q & A’s and I love it so much that I purchased the wide angle and zoom as well. Nope, no kick back from them. Just sharing what works for me, so I’m glad you like it, too! Hi Dixie. Does this work on Android phones? Hey Dixie, Awesome Vids and Shots! What other camera gear do you use? I see you mention a Mavic drone. What about DSLR Camera? Any film gear or accessories?